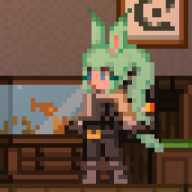 Is this because of the recent updates to Starbound? That is a nice avatar picture. Errors4l and MilkCalf like this. Hi, what kind of status effects causes a player to be beamed back to their ship? And is it possible to be immune to it? Don't know, check the assets! Pretty sure they have "beam" in the name, but they shouldn't work on players. alright, thanks, I figured out they used some kind of glitched monster to kick everyone back to the ship. Another question, how do I make a weapon alt-fire so that it shoots out plasmatorpedo or is that impossible? Oh alright I figured it out, thanks. Alright. Ive got everything down and its working! Thank you. The Wiki might be a bit outdated on some minor things though. But im sure you are busy with other things so no rush on that. Thanks again! Already got that noted down! Glad you got things working. Hi, I'm using the amazing drawables generator but it seems like the inventory icon is bugging out, parts of the item on the inventoryicon doesn't appear at all! Could you DM me the image you used so I can see for myself? A friend of mine used 1.0.5 and V2 to create a gun and a inventoryicon. Found the issue, don't know of a fix. I posted the issue on GitHub together with a workaround. I've messaged you the code for your inventory icon. Btw i wanna ask you , do you think its possible to make a mod for a 3th shortcut bar ? If yes it could help everyone for everything (but the idea come first for Wedit tools x) , also if its the case you think you can try to make it please ? Hi and thanks for your mod , THE mod (of cours i speak about world edit) , a tool already well know in minecraft since some years , a must-have for everyone who like build or create , and YOU made it for starbound , it opens possibilities almost endless ^^ you deserve more follower. A friend of mine, Magicks_, actually has an unfinished dye interface. It's currently targeted at clothes but he might add in object support. Greetings! So I hear you have an editor of maps but I don't see it anywhere in your mods list. Also I would like to know if theres a way to make SBSE compatible with Nightly Builds. The thing you've heard about is actually an in-game tech mod, not some full-fledged application. I'll be releasing it in the mod repository around the release of Starbound 1.0. I haven't worked with SBSE and it's not open source, so I can't help you with the compatibility thing. I've replied to the PM you sent me. Hope it helps! Oh sorry there was a typo i did in the review, i was meant to say "spawnableitempack and spawnableitempackOBJECTS"
also i checked the mods folder there wasn't another outdated version of the mod. Every version has the same folder name. Please remove the folder entirely and then unpack the latest version (currently v3.32). well nice seeing you here... its me Jeremy Rx1052 but now i am known has Alfred Ikzk its nice to see you again. Hey! I initiated the conversation that has the information about the missing guns in the Spinning Wheel. Did you check it? I hope you will soon renewest your mod. Hey man, when I downloaded and installed your mod, all recipes transferred over to my metal workstation ect. This includes any new character I make even when the mod is uninstalled. Do you know how to fix it? The new update just came in today, it would great if you started working on a new version for Furious Koala. You're mod's awesome! Thanks, but please read my last reply to the discussion thread. Hey ya bro, the object spawner doesnt work on ur mod any ideas?